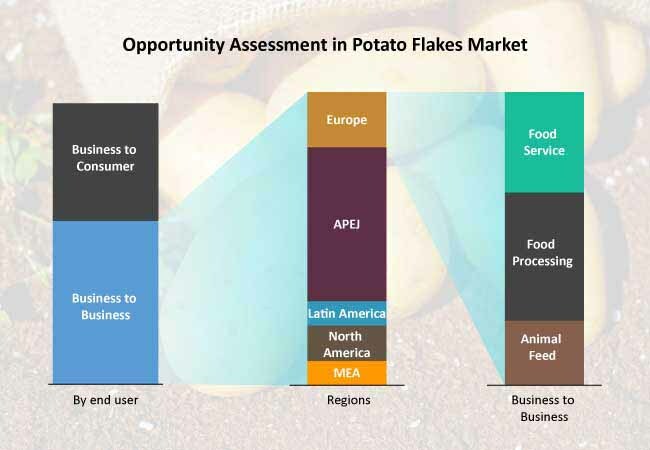 Asia Pacific is likely to remain as mainstay for the manufacturers in potato flakes market as the region is considered as home for world’s leading food importers, exporters and producers. APAC potato flakes market continues to witness growth avenues on the back of increasing demand for the nutrition-rich processed foods from the rapidly rising middle-class population. Enhanced pace of activities amongst the key players seeking to enter or consolidate their position, in lineup with massive changes in the consumer lifestyle generated by ripple impacts of urbanization has been some major factors driving the growth of Asia-Pacific potato flakes market. India is expected to generate considerably high revenues as the nation stands second in the world, after China with regards to production of consumption of potatoes. Major players across the globe are planning to tap opportunities in Asia-Pacific owing to government policies, foreign direct investments and by means of mergers and acquisitions. Rapidly increasing urbanization in China and India have been boosting the Asia-Pacific potato flakes market and this trend is likely to continue in the forthcoming years. Demand for organic potato flakes in China is expected to increase at a gradual pace, thereby creating growth opportunities for conventional potato flakes during the forecast period. The region has been observing increase in consumer demand for natural products, which involves the usage of fewer chemicals and additives. Although revenues from conventional potato flakes is significant, sales growth of the organic potato flakes is anticipated to be considerably faster during the forecast period. Organic farming is likely to remain a significant transformer in the holistic framing practices employed in agriculture-based nations across the globe. Fact.MR predicts that potato flakes market will expand at an impressive 7.0 CAGR over the assessment period, 2018-2028. Government initiatives for helping entrepreneurs in setting up successful production units for potato flakes as well as offering them radical technical intelligence are expected to remain key factors for the progress of potato flakes market on a global basis. Sales of potato flakes have been significantly impacted owing to planned and organized approach of the modern trade formats towards logistics and distribution management as well as demand aggression across various product ranges. Key players and manufacturers in potato flakes market have been taking immense efforts in focusing on manufacturing of light-weight and high-quality potato flakes, thereby expanding their online presence. This step taken by the manufacturers will significantly benefit in outreaching more customers and to gain higher shares. Increasing expenditure on processed and ready-to-eat products are expected to significantly drive the revenue growth of potato flakes market. According to the recent analysis by Fact.MR, there has been significant increase of the retail sales in baby food industry together with surging demand for potato flakes as an essential ingredient in various baby food products. This in turn creates significant growth opportunities for potato flakes market on a global basis. Growth of internet proliferation, surging e-commerce and increasing online stores compared to review sites have been considered as the key transformers, which has enabled the consumers in comparing price levels of the potato flakes product options.